Where we once used fear to guide how we guard ourselves against the ‘killers of the deep’, SharkSafe Barriers works for both sides, human and Selachii, in all their toothy glory, to the benefit of both. Popular media likes to demonise these predators, and the reactive response is to do whatever is necessary to keep them from us. In most cases, this means gill nets, which reduce the number of shark attacks by reducing the amount of sharks. It’s a bit of a scorched-sea policy to protect our bathers and fishermen. Every year, thousands of sharks – the potentially dangerous ones, and the completely harmless ones – are tangled and suffocated so that we can get a bit of a frolic in the ocean come December time. Not to mention the turtles, dolphins, whales and other unlucky marine life that just happen to swim a little too close to our part of their environment. Another, more aggressive option is baited hooks, which I don’t think I need to explain. Lastly, there is the costly, and labour-intensive prophylactic method of exclusion nets, which are safer for the animals, but unrealistic for the aforementioned reasons (some municipalities, especially in Europe, spend up to €3m a year on beach safety programs with exclusion nets). Wouldn’t it be great if there was something else we could do to keep our seas safe, without harming those that live there? Surely there’s something in nature we could use as inspiration? And maybe, we can try something that doesn’t cost so much that municipalities couldn’t afford it, even if they wanted to? Evidently, yes, to all three questions. Out of the brain of a conservationist and shark behavioural specialist, Michael Rutzen, swam the origin of idea for SharkSafe Barriers™. He noticed that sharks refuse point-blank to move through kelp forests (some suggest this is to avoid clogging their gills), to the point that seals use them to hide from their scaly foes. Inspired by this, Michael, with marine biologist Dr Sara Andreotti and Prof Conrad Matthee of Stellenbosch University, built a synthetic kelp forest with pipes, anchored to the seafloor, that act as a harmless visual deterrent, and can be placed pretty much anywhere. When Dr Craig O'Connell was brought on board in 2011, ceramic magnets were added to the pipes, which overwhelm the sharks’ sixth-sense with their magnetic field, adding a potent second defensive layer to the product. The innovation was tested in South Africa and the Bahamas. It was tested with chum in the water, and in the notoriously large swells of the Cape of Storms. They even tried to motivate sharks through SharkSafe Barriers™ by deploying a canister of fish behind it. 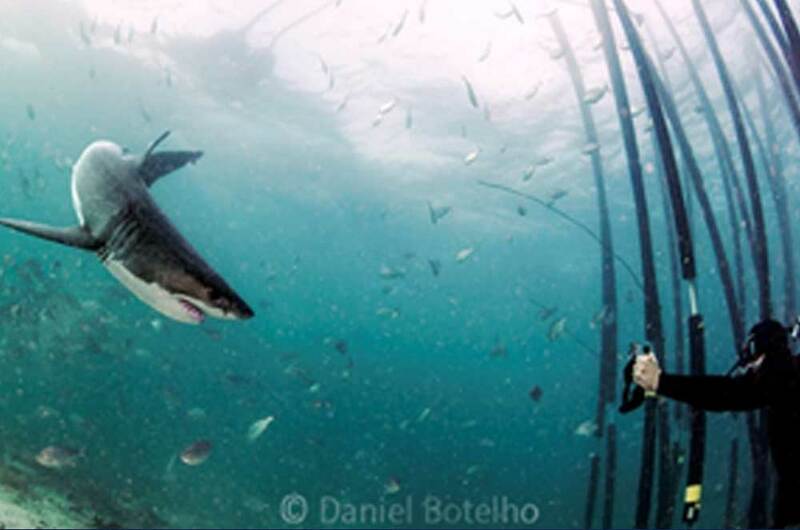 And, for two years, they left the prototype in Gansbaai’s Shark Alley. To date, not a single shark, of any species, has crossed the line of defence. This innovation won them the chance to pitch, as one of three national finalists, in the GCIP Cleantech Open. The Programme is jointly implemented by UNIDO (the United Nations Industrial Development Organization) and TIA (the Technology Innovation Agency), with funding from GEF (the Global Environment Facility). This process successfully ‘netted’ them mentorship, and will provide them with access to investors to fully develop the ability to anchor the barriers to different kinds of ocean floor surfaces. Innovus patented the innovation and helped them with planning the business strategy ahead. The SharkSafe Barrier™ IP is now protected nationally and Internationally. SharkSafe Barriers™ is now on its way to being a fully-fledged, stand-alone business. While still technically a start-up, they are rapidly aiming to make our seas safer. For everyone. The next phase is to develop a permanent way to anchor this barrier specifically to the sandy seabeds. Following that, it’s a matter of getting in front of municipalities, sharks’ boards and departments of tourism across the world, so that they can convince them on their safer, cheaper, more effective solution. They believe they can rid all gill nets and baited hooks in just ten years, which would go a long way to repopulating our seas with some of the most amazing, endangered species, who have just as much right to live there as we do to play there. If you’d like to be a part of the journey, or want to see a few videos, and find out a bit more, please visit them here. The kettle is one of the few things in our kitchens we don’t expect too much out of, apart from hot water. Where are the aesthetics? Where is the efficiency? Due to his academic focus, Ebert knew this was something he could take on, and give the world one of the things kitchens have been sorely lacking up until now. The original version cleverly used a dome-shaped inner surface, which increased the amount of surface area in contact with the water, heating it faster. But just a small decrease in boiling time wasn't enough. It had to be more. The creation of a functional, yet beautiful home appliance was a team effort and an expensive one at that. While Ebert had the vision, he needed others with the skills and resources, so he turned to Innovus for solutions. They had the contacts and plan-of-action that he didn't. And, so, with a clear starting point, the Clever Kettle project got going at full steam. Based purely on the idea, the TIA Seed Fund gave him a grant of R500k towards the development of the concept into a working prototype. When he spoke to product developers, Skeg, they suggested tweaking the dome shape into a chimney, running through the centre of the kettle, further increasing surface contact the transfer of heat to the water. This subsequently became a spiral chimney, which was even more effective. Sarel Rautenbach, an 'outside the box thinker' at Stellenbosch's GlassChem chipped in by developing a hand-blown glass outer-dome at an affordable price (significantly beating the R300k needed to create the one-off dies at glass factories in Germany, which was part of the original plan). They are now working together to perfect the most pleasing design. Guy Wood, the owner of Pieter van Dijk Studios and one of the only coppersmiths in the country is responsible for the crafting of the spiral chimney inner that will become the centrepiece of the entire design. And, man, is it looking good. The result of all the hard work is a cup of tea or coffee in 4 to 5 minutes, made by a kettle with a unique, confident sense of style. It is a combination of Blade Runner retro-futurism and steam-punk fashioned elegance. The rosé copper chimney, full at the bottom and gracefully spiralling upwards, narrowing as it goes, all encased in a symmetrical glass orb will turn heads, and open wallets, very soon. Ebert knows that this innovation, once fully optimised, will be of more benefit to those who can't afford it. He plans to use the high-value, high-desire version to pave the way for a new, cost-effective range of products that will boil water for cooking and cleaning for lower income markets, using our natural acquisitiveness to subsidise those who will benefit financially. When you can boil water faster, you save on the gas used to heat it. Every little bit helps. For us, the avid consumer, we should be able to pick up our own Clever Kettle (which is the working name) in the very near future. Kuze is a brilliant, simple, robust innovation that aims to stop the variety of severe ailments that come from a sedentary lifestyle where they start – in our schools. If you are reading this at your desk, there is a good chance you are sitting down. In fact, there is always a good chance you’re sitting down. As a species, we sit for around 13 hours a day and spend another eight flat on our backs. We sit when we are working, we are seated when we eat, and we plonk ourselves down again to watch TV, to recuperate from a hard day of sitting. It’s the most convenient way to do many of the things we need to do, but it is also incredibly detrimental to our health. Humankind evolved to walk many kilometres every day, in search of food and companionship, upright. A non-sedentary lifestyle keeps our backs straight, our blood flowing and our minds sharp. ‘Sitting Disease’ is the terms used for a metabolic syndrome associated with an over-reliance on our posteriors as a resting area, and the ill-effects that go along with it – a slow metabolism, shorter breath, an increased risk of cancer, heart attacks, strokes and Type II Diabetes. When we are at our desks, we’re far too close to our reading material, which is responsible for the boom in optometric sales. That lower back pain you are unhappy about can be attributed to sitting, too (it is the largest cause of absenteeism). To add one last (terrifying) fact: many experts are calling it as significant a risk as smoking is. Smoking! Sitting for just 5 hours a day can shorten our lives by two years. This is what sitting does to us as adults. But what about our kids…? It’s this very, very big problem that Kuze aims to fix, with a 40cm x 40cm solution. Taken from the Zulu word ‘Up!’, this multipurpose box becomes the only standing desk children will ever need, so they can be vertical (with all the associated benefits) while they learn. Because it has six different adjustment settings, it can be adjusted to whatever height best suits the individual child, so they are completely comfortable, regardless of whether you are 8 or 18 years old. It is made from repurposed timber, so it is inexpensive and almost any school (or family) can afford to have them in abundance, unlike the existing ‘fancy’ standing desks, It’s lightweight, so it can be carried between classes, and to and from school, adorned in personalisation, stickers or a favourite football team’s emblem. Oh, and it makes a mighty fine, height-adjustable seat, as well, for when the kids actually need to take a load off for a few minutes. The team of physiotherapists who developed Kuze, including Prof Quinette Louw, Dr Sjan-Mari van Niekerk and Dominic Fisher, at Stellenbosch University, and designer Jaco Langenhoven, are justifiably proud of what they have created. It is a simple solution that (apologies for this) ‘ticks all the boxes’. Our kids will be able to concentrate better and thus learn more, faster. Chiropractors and optometrists will weep at the lost revenue, but our learners will stand tall. They are testing it in select schools, where it’s receiving supportive reviews from teachers and learners. To take it further, they need to secure partners and investment that will allow them to develop a mass-production facility and process (hopefully using local craftsmen and artisans), so they can get into as many schools as possible. There is a massive push globally to set our workforce right, and we are seeing all kinds of solutions that allow corporate workers to do the best they can. (Those uber-progressive Finns have even started a ‘Schools on the Move’ programme, to maximise the health benefits of being active.) The team behind Kuze are making sure that South Africa’s school children aren’t the last ones to the party.